PIANO MADE WITH HAWAIIAN WOOD. Bergstrom Music Company [hui kuai mea kani Bergstrom] received a piano made with koa wood. This piano was made in Chickering, Boston under the order of Prince Kalanianaole. The cost for the building fo this piano was about $1,000, and the koa wood it was made from was sent from Hawaii nei. The look of this instrument is lovely, and above where it is played is placed the crown of Hawaii and the words “Kulia Kanuu.” The instrument will be placed under the care of Prince Kawananakoa when the Prince Kalanianaole and his wife returns from their trip around the world. Ke Aloha Aina, Buke VII, Helu 5, Aoao 5. Feberuari 2, 1901. Roots of koa stretch to India? 1919. 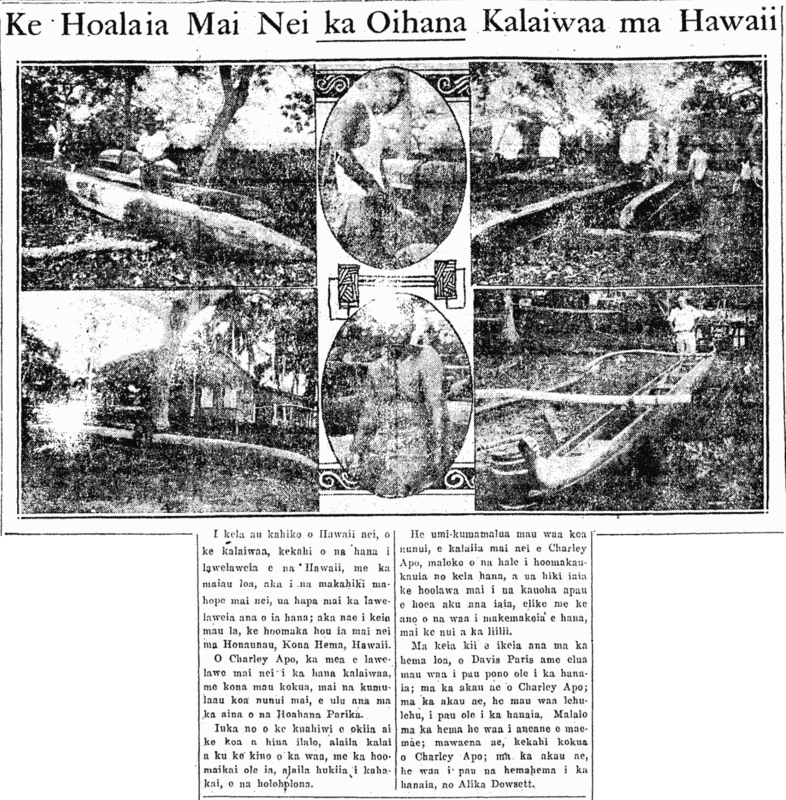 More on the building of the Bishop Museum, 1902. KOA TREES FOR THE MUSEUM. Aboard the Clipper Ship, S. N. Castle, were taken koa trees from the two Kona [North and South Kona] for cases and other decorations for the Museum standing at the Kamehameha School. The koa trees will be taken to San Francisco and from there they will be taken aboard steam locomotive to Minnesota, and there they will be made into beautiful glass cases [ume aniani] or perhaps beautiful stairs for the planned annex for the Museum. These koa trees were selected from places in Kona, Hawaii, and when they are fashioned, they will be fine decorations. When the idea for a new annex first came up, the lack of koa was noticed, being that only native woods were wanted for the interior. People were soon sent to the two Kona to search for koa fitting for the purpose, and when it was found, it was sent here to Honolulu. All together, the gathered lumber totals 26,000 feet. They weigh seven tons. Being that the job was given to a company in Minnesota, the koa was sent there, and from there it will return to Hawaii nei. Ka Nupepa Kuokoa, Buke XL, Helu 5, Aoao 6. Ianuari 31, 1902.